Event Data Recorders (EDRs) were first introduced by General Motors (GM) in 1974. That data was only available to GM; however, since 1994 more and more vehicle EDR's have recorded data that can be gathered. The data captured can be imaged and is being used by vehicle manufacturers, law enforcement officers, and collision reconstructionists to better understand what is happening in a collision. In accident investigation, EDRs have the potential to provide independent measurements of crash data that would elsewise be estimated by reconstruction methodology. EDRs go by different names: Airbag Control Module, Restraint Control Module, and System Diagnostic Module to name a few. Typically, these modules run an algorithm on sensor data and activate the vehicle's restraint system when a certain threshold is met. Whenever the vehicle's safety system experiences an event, it determines what, if anything, needs to be done. The EDR communicates with other modules and systems within the vehicle and reacts to the magnitude of the event. Some EDRs are not connected with the restraint system. The Powertrain Control Module communicates with the Engine Control Unit and the Transmission Control Unit to control the vehicle's drive train. These also record data in some makes and models. Regardless of the primary function of the EDRs, they capture data during a collision event. This data may be locked where it cannot be overwritten, or it may be unlocked. An unlocked event can be overwritten by a more severe event, or lost after the ignition has cycled a predetermined number of times. Based on the technology within the vehicle, this data may be limited to longitudinal change in velocity, or it may contain detailed information prior to and during the event. The information collected from an EDR is dependent on the advancement of technology in the vehicle and the accessibility of that data. In 2000, the Crash Data Retrieval (CDR) kit was introduced, and it allowed access to GM EDRs from 1994 and up. In 2003 Ford Motor Company joined up and the CDR kit was able to image Ford vehicles. Shortly after Ford, Chrysler vehicles became accessible. As of 2012, the Code of Federal Regulations 49 CFR part 563 addresses EDRs in vehicles, and with only a few exceptions, requires that manufacturers make the data accessible if the vehicle has an EDR. Some manufacturers joined up with CDR, others designed their own proprietary system of accessing the data. The make of the vehicle will determine what system will be needed to glean the data. 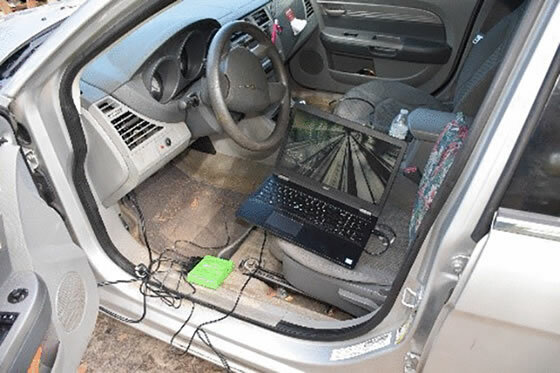 In the same way a mechanic accesses the vehicle's computer system through the diagnostic link connector (DLC) to determine what is going on with a vehicle, a qualified person with the proper system can connect into that same port and image the data. Though not the only way, this is preferred as it allows the module to communicate with other systems within the vehicle that supply data not kept within the EDR. 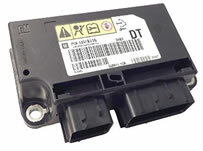 If there is a problem with the electrical system or the vehicle is too damaged to allow DLC connection, a certified person with the proper equipment can connect directly to the module. Likened to the "Black Box" used in aircraft, EDRs have a similar value with a different approach. Where radio transmissions and conversation within the cockpit are recorded in airplanes, EDRs are limited to storing the information within the vehicle's computer system at, and sometimes prior to, the time of an event. 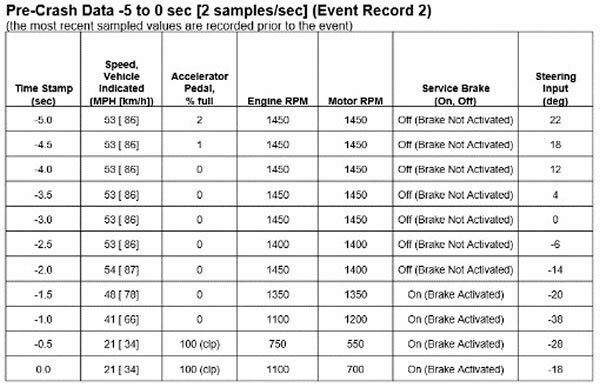 Depending on the technology within the vehicle, EDRs can store details about change in velocity (longitudinal and lateral), vehicle's speed, service braking, steering angle, safety belt usage, seat occupancy, engine RPMs, engine trouble codes, ignition cycles, stability, traction control, cruise control, ABS, percentage of accelerator used, and more. The information is related to the event by time in seconds and milliseconds. With all the information that is available from an EDR, we can understand significant specifics of a collision. Conversely, there is also the ability to confuse data and mix up events that are related or not related. CDR reports list out limitations that outline how the data polarity must be applied, and other things that must be considered when viewing the report. There are limitations not listed that must be considered. The data cannot be taken at face value. The explanation of locked and unlocked events and the storage of that data is a great example of the potential for error. Some EDRs will store more than one event, be they locked or unlocked. 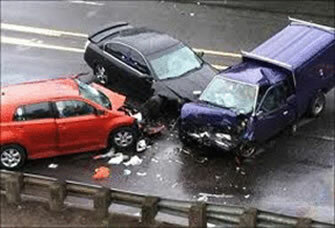 With that is the possibility that the stored events may have happened during one collision. For example, a vehicle collides with another car then exits the roadway striking a ditch and a tree for a possibility of three events within that one crash. Taking that same idea a little further, there is a possibility that one or more of the events captured by an EDR could have happened prior to the collision being investigated if the event happened within the parameters allotted for the retention of unlocked data. In any EDR analysis, applying the data requires a reconstruction to verify the information is applicable to the investigation. Simply looking at the fields and graphs from a report does not validate the data belongs to the event nor answer the questions of that collision investigation. An accredited collision reconstructionist and EDR analyst can complete that task. 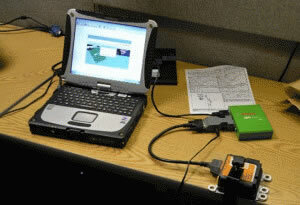 The Event Data Recorder is a great tool in an investigation toolbox. The plethora of data available in new model vehicles gives many details that would otherwise be ranges or estimations at best, even the limited data of older model cars can be utilized by a reconstructionist. Using the information in an investigation can be a tricky thing; the smallest of details may affect the accuracy of the findings. When it comes to imaging and analyzing the data from an EDR, make sure you are using a qualified expert with experience. Aaron "Al" Duncan II is a vehicle collision reconstructionist with Warren. 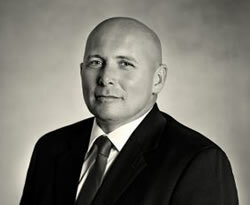 Prior to joining Warren, he worked for 23 years as a South Carolina Highway Patrol Trooper to include 10 years as a Multi-Disciplinary Accident Investigation Team (M.A.I.T.) member. Al is accredited as a Traffic Accident Reconstructionist by The Accreditation Commission for Traffic Accident Reconstruction.